The Lynchburg Lions Club held its monthly dinner meeting Feb. 25 at the Lions Club Building in Lynchburg. Following a carry-in dinner, the club honored the winners of its annual Peace Poster Contest. All sixth graders at Lynchburg-Clay Middle School competed in November and the club presented prizes to the winners. The students discussed a variety of issues related to school and community activities then the entire group heard about the goals and activities of the club. 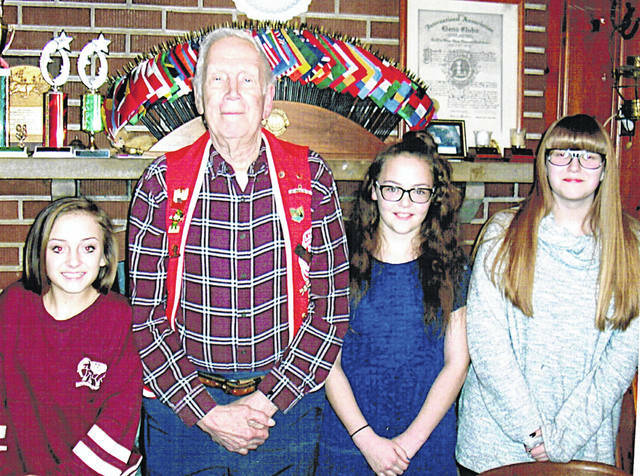 Pictured, from left, are Aubrey Stack, Lynchburg Lions President Bob Roth, Miranda Smith and Brianna Sprik.